"Is It Raining In Your Life of Worship"
Welcome to "Is It Raining In Your Life of Worship"
Here lately, I for some reason have been so depressed, so tired, and really not positive on why. When I read this Life Point in Joyce Meyers Bible, even though I know we are to praise and worship God through everything I have been swallowed up in the way I have been feeling and haven’t been practicing what I have been telling you. I ask that you forgive me. Now, through all that I have been feeling and going through I should’ve been worshiping God. Sometimes I feel like it is impossible with all that happens in my life –– people in and out, can’t get done with what I am doing for the Lord, for myself, my house, or just my personal time. Always, sick with something, or something happens where I can’t get to church and the past 5 -6 Sundays hadn’t been able to. But, I have learned we should always give Thanks and give God the praise for it all, no matter how we feel, no matter what we go through or what some people think. I don’t doubt God at all in His ability to help me or get me through what I am going through. I do need Him and need Him to give me strength as I go through it, and show me I am still worthy to finish all that He has me doing. 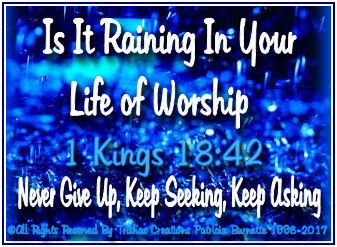 Always, give Him Praise and things will start pouring down in a blessed rain. Never give up, keep seeking, keep asking, keep believing, keep trusting, keep loving Him and everyone you come across, even if you do not know them. Because He loves you and the Blessed Rains & Answers will come!!! I am not perfect , I make mistakes all the time, but I do Thank Him for everything, everyday all the time, we all owe Him Our Lives, our everything! !